If Kennedy had been perceived as a class traitor, he would have been replaced peacefully. The fact that he was killed shows that any domestic conspirators must have come from some way below the top of the internal power structure. President Kennedy’s assassination has generated innumerable conspiracy theories, many of which fail to demonstrate a plausible relation between the assassination and Kennedy’s role within the political system. Did the CIA Kill President Kennedy? Both examples contradicted the Kennedy administration’s official policy, and both are pertinent to the assassination. The CIA, which helped to frame Oswald, was closely associated with elements of the mafia and the anti–Castro Cuban exile movement. It is not at all implausible that the assassination arose from within this loose alliance of interests. Did the Military–Industrial Complex Kill JFK? and capitalist ideologues would lose their influence over the economies of south–east Asia, with the possibility of a contagious outbreak of independent development throughout the US’s sphere of influence. The so–called military–industrial complex reflected the interests of domestic elites far more powerful than any ad hoc grouping of mobsters, anti–Castro Cubans, disaffected CIA agents and a few gung–ho generals who opposed President Kennedy’s actions during the Cuban missile crisis. or he was working within the limits set by established power, and was eliminated by individuals or groups for reasons that had nothing to do with the interests of elite institutions. and an action that is independent of such institutions. Many JFK conspiracy theories fail to make this distinction, which is crucial to any useful explanation of who killed Kennedy or why he was assassinated. The distinction is crucial also to understanding the significance of the assassination. The further removed any conspirators were from the institutions of power, the less the assassination has to tell us about the workings of the US political system. The lack of any substantial change in official policy toward Cuba after the JFK assassination leaves only one credible reason why domestic elites might have had Kennedy removed from office by force: their disapproval of his policy toward Vietnam. When Kennedy became president, there were about 700 members of the US military in South Vietnam. By November 1963, there were 16,700. The South Vietnamese army became larger and better equipped. A concentration camp system, known as the ‘strategic hamlet program’, was established to contain dissent in rural areas. Chemical warfare was used in South Vietnam to destroy forests and crops. Napalm was used against rural villages in South Vietnam. A Change of Policy Under President Kennedy? One dominant theme is visible in the historical record of US policy discussions under the Kennedy administration: that the US military would withdraw from South Vietnam when the local regime had imposed its control over the population. In response to the changing military and political situation in South Vietnam, there was much debate in US military, diplomatic and political circles about the best way to achieve this end. This policy had first been proposed in April 1963, and was implemented in October when the corruption and harshness of Ngo Dinh Diem’s regime were seen as counterproductive to US interests. The State Department interpreted the memorandum as a hint that the regime ought to ease its repression of dissidents and political enemies. Johnson was more willing than Kennedy to be persuaded of the need to increase US military involvement in south–east Asia, but this does not imply that he was installed for that purpose, nor that it was necessary for Kennedy to be replaced in order for military involvement to increase. The first substantial increase under Johnson did not happen until February 1965. President Kennedy had consistently aligned himself with the less militaristic of his advisers, while remaining within the scope of acceptable debate. Although the official written record is incomplete, there is nothing in the publicly available documents to suggest that Kennedy strayed from the doctrine that the US military may only withdraw once the domestic rebellion is contained. The current state of the evidence shows that President Kennedy’s policy toward Latin America, Vietnam and the Soviet Union did not go against the interests of US elites. Nor had he caused problems by implementing radical domestic policies. The Kennedy administration’s civil rights legislation was a half–hearted response to a growing popular movement.13 There was little significant pressure on Kennedy to change the wealth distribution mechanisms to favour the general population rather than investors and owners. Kennedy showed no signs of independent action toward this; unsurprisingly so, since he personally benefited from the existing mechanisms. In third–world dictatorships, a coup d’état by one political force against another can succeed because power is highly concentrated and easily targeted. In relatively democratic, industrialised nation states, elite power is distributed sufficiently widely to make a violent coup difficult to achieve. Owners of capital may threaten to invest abroad rather than within the domestic economy, or to withdraw investment from particular projects. Political sponsors may threaten to withdraw financial and other forms of support. None of these measures was used to any significant extent against Kennedy. Even if the dominant social institutions disapproved of the president’s policies toward Vietnam, Cuba, domestic civil rights, or anything else, they evidently did not disapprove enough even to impose peaceful constraints on his actions.14 President Kennedy must have been removed from office by an ad hoc group working outside the normal structures of institutional power. The JFK assassination was the result of a relatively small–scale conspiracy rather than a large–scale coup d’état. It was obvious from very early on that President Kennedy’s assassination was a conspiracy. The transparent absurdity of the single–bullet theory by itself rules out a lone assassin as the culprit. Many conspiracy theorists, however, slip too easily into blaming institutions for the murder. Just because this or that employee of the CIA or the army or the Dallas police department may have played a part in the assassination, it does not follow that the CIA or the army or the police were the driving force behind the assassination. The notion that Kennedy was a gallant hero, killed by domestic institutions in a coup d’état,16 is almost as implausible as the notion that he was killed by a lone nut, Lee Harvey Oswald, firing an antiquated rifle with a broken telescopic sight. In both cases, the ‘how’ and the ‘why’ are missing. Oswald’s motive for killing Kennedy, that “he was a general misanthropic fellow” who wanted to get his name in the history books,17 is no more convincing than the proposition that the owners of the country would eliminate someone who was serving their interests faithfully, or that, if it suited their needs to replace Kennedy, they would risk doing so with violence rather than with any of the peaceful means at their disposal. For the role of the CIA’s Mexico City station in the framing of Oswald about seven weeks before the assassination, see “A Little Incident in Mexico City”. At around the same time, Oswald or an impostor appeared in Dallas, and a telephone call implied that Oswald thought President Kennedy should be assassinated; see Silvia Odio’s Visitors. For the ‘CIA killed JFK’ theory, see e.g. Michael Calder, JFK vs CIA: The Central Intelligence Agency’s Assassination of the President , West LA Publishers, 1998; and L. Fletcher Prouty, JFK: The CIA, Vietnam and the Plot to Assassinate John F. Kennedy , Citadel Press, 2003. The CIA carried out policy determined by the National Security Council, which was heavily influenced by the White House. For plausible deniability, the function that allows government officials to pass blame to the CIA, see the Church Committee Interim Report, pp.11f. The CIA’s association with mobsters was made public by the Schweiker–Hart Report of the Church Committee. For the assassination attempts on Castro, see the CIA Inspector General’s Report on Plots to Assassinate Fidel Castro (NARA RIF no. 104–10213–10101), 1967. One such plot was even in progress on the day of the JFK assassination, involving CIA agents and a former Castro loyalist, Rolando Cubela Secades, code–named AM/LASH. For US involvement in Vietnam under Kennedy, see Noam Chomsky, Rethinking Camelot: JFK, the Vietnam War, and US Political Culture , South End Press, 1993; and William Conrad Gibbons, ed., The US Government and the Vietnam War: Executive and Legislative Roles and Relationships, Part 2 (1961–64) , Princeton University Press, 1986, pp.70f. The destruction of crops: Foreign Relations of the United States, 1961–1963 , vol.2, US Government Printing Office, 1997, pp.673ff; and William A. Buckingham, Operation Ranch Hand: The Air Force and Herbicides in Southeast Asia , US Government Printing Office, 1982. The ‘strategic hamlet program’: Milton E. Osborne, Strategic Hamlets in South Vietnam: A Survey and a Comparison , Cornell University Southeast Asia Program Publications, 1970. NSAM 263: Foreign Relations of the United States, 1961–1963 , vol.4, US Government Printing Office, 1997, pp.395f. 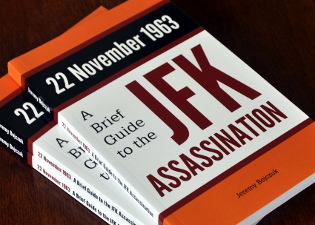 For US involvement in the coup d’état against Diem three weeks before the JFK assassination, see John Prados, ‘JFK and the Diem Coup’ at http://www.gwu.edu/. NSAM 273: Foreign Relations of the United States, 1961–1963 , vol.4, US Government Printing Office, 1997, pp.637–40. The extension of the war to North Vietnam is mentioned in paragraph 7. For the case that President Kennedy’s proposed withdrawal from Vietnam signified a drastic change in policy, see e.g. John Newman, JFK and Vietnam: Deception, Intrigue, and the Struggle for Power , Warner Books, 1992; Peter Dale Scott, Deep Politics and the Death of JFK , University of California Press, 1993, pp.24–37; and James K. Galbraith, ‘Exit Strategy,’ Boston Review , October–November 2003. For the case against, see e.g. Noam Chomsky, Rethinking Camelot: JFK, the Vietnam War, and US Political Culture , South End Press, 1993; and Richard J. Walton, Cold War and Counter–Revolution: The Foreign Policy of John F. Kennedy , Viking Press, 1972. For the impersonation of Lee Harvey Oswald in Mexico City in late September, see “A Little Incident in Mexico City”. For his possible impersonation in Dallas, see Silvia Odio’s Visitors. A transcript of President Kennedy’s speech to the Forth Worth Chamber of Commerce at the Texas Hotel on the morning of 22 November 1963 can be found at http://www.presidency.ucsb.edu/ws/index.php?pid=9538. For the escalation of the arms race under Kennedy, see Desmond Ball, Politics and Force Levels: The Strategic Missile Program of the Kennedy Administration , University of California Press, 1980. For the Kennedy administration’s activities against Cuba, see Warren Hinckle and William Turner, The Fish is Red: The Story of the Secret War Against Castro , Harper and Row, 1981. For the role of the Attorney General, Robert Kennedy, in setting up Operation Mongoose in contravention of both US and international law, see Raymond L. Garthoff, Reflections on the Cuban Missile Crisis , Brookings Institution, 1989, p.32. See, in general, William Blum, Killing Hope: US Military and CIA Interventions Since World War II , Common Courage Press, 1995. For a sympathetic view of Kennedy’s policies in Latin America, see Stephen G. Rabe, The Most Dangerous Area in the World: John F. Kennedy Confronts Communist Revolution in Latin America , University of North Carolina Press, 1999. For the overthrow of the government of João Goulart in Brazil, which was planned and approved under Kennedy and carried out under Johnson, see Jan Knippers Black, United States Penetration of Brazil , University of Pennsylvania Press, 1977. For the Kennedy administration’s role in prioritising the control of internal dissent in Latin America, see an account by one of the policy’s planners: Charles Maechling, Jr., ‘The Murderous Mind of the Latin American Military’, Los Angeles Times , 18 March 1982, part 2, p.11. Partly in order to ensure the support of segregationist senators, the Kennedy administration consistently appointed segregationist judges in southern states, who failed to enforce existing civil rights legislation. Only after the violence in Birmingham, Alabama, early in 1963, did Kennedy treat the matter seriously, but even then he took the slower route of proposing new legislation rather than using his executive powers. See e.g. Howard Zinn, SNCC: The New Abolitionists , Beacon Press, 1964, pp.203ff. An example of the peaceful replacement of a manager who had outlived his usefulness was President Johnson’s de facto resignation following the decision of domestic economic elites early in 1968 to withdraw US forces from Vietnam. In response to the Tet Offensive, the US military calculated that 200,000 extra troops were required. The need to contain the widespread dissent at home meant that this many troops could not safely be spared. When the domestic economic recession was taken into account, the war’s benefits were now outweighed by its financial costs and the risk it posed to the existing distribution of power. Johnson, the political face of the war, was given the news by his Senior Advisory Group on Vietnam on 26–27 March; see e.g. David Halberstam, The Best and the Brightest , Random House, 1969, p.653. He took the hint and announced four days later that he had decided not to seek re–election in 1968. For a political insider’s view, see James R. Jones, ‘Why LBJ Bowed Out,’ Los Angeles Times , 30 March 2008. For the military’s assessment of the problem of domestic dissent, see the Pentagon Papers , Senator Gravel Edition, Beacon Press, 1972, vol.4, esp. pp.541, 564. The evidence of Dr Pierre Finck, one of the pathologists at JFK’s autopsy, makes it clear that senior military figures prevented the dissection of the president’s back and throat wounds, and implies that they did this to avoid discovering definitive evidence of shots from more than one direction. This view was made popular by Oliver Stone’s movie, JFK . For a rose–tinted interpretation of Kennedy as a saviour figure, motivated by high moral principles and cruelly cut down by the forces of evil, see James Douglass, JFK and the Unspeakable: Why He Died and Why It Matters , Orbis Books, 2008. The book incorporates a very good general account of the JFK assassination and the activities of Lee Oswald, although not all of the evidence it presents in favour of a conspiracy is equally reliable. Lyndon Johnson asked Richard Russell, one of the Warren Commissioners, about Oswald’s motive, and was told that “he was a general misanthropic fellow, that he had never been satisfied anywhere he was on earth … he had a desire to get his name in history and all”. See Richard Russell and the Warren Report.